While it is bitterly cold outside and the sun hasn’t shone for days, I’m in a rather chipper mood. And the reason is because I came across some Meyer lemons at Hiller’s Market, a grocery store here in Ann Arbor. Some might have thought I was estatic. All’s I gotta say is, if you’ve never jumped up and down in the produce aisle, you really ought to. Hell of a good time. As the cashier was ringing up my groceries, he picked up the Meyer lemons, looking a little confused. Are these oranges or lemons? They’re lemons, dude. Smell them! No, SMELL them. They’re a-mazing! He sorta smells them and then nonchalantly continues to ring them up. I’m thinking, What? No Oh, my God, you’re right, no You have saved my life. I get nothing from him. Fine, more for me, then. I always make a lemon tart with these first Meyers of the season. I thought I’d go savory this time around and made a dish I first had in Brussels on a backpacking trip. I was backpacking alone then and this weirdo starting following me for at least half an hour as I was walking into town. I must have looked scared because this other Belgian guy came up to me and asked me if I was okay. I told him I was fine but I thought maybe this man was following me. He told me not to worry and walked with me to my destination to make sure I was safe. When we arrived, I thanked him and he went on his way. His name was Bruno. I think Bruno’s a good name for a boy, don’t you? Right, the dish. I’ve made this dish often, yet I’m still amazed how easy it is. Cook some shallots in a little butter, add wine (and lemon juice, in this case). Toss the mussels into the pan and steam. In minutes, you have perfectly cooked mussels bathed in a fragrant broth that you can mop up with some crusty bread. Bruno would approve. Heat a large kettle/pot on med-high and add the butter and shallots. Cook for approx. 1 minute. Add the wine, lemon juice, parsley sprigs and pepper. Bring the liquid to a boil and let boil for 2-3 minutes. Add the mussels to the kettle. Cover tightly and boil quickly over high heat. Frequently grasp the kettle with both hands, your thumbs clamped to the cover, and toss the mussels in the kettle with an up and down slightly jerky motion so the mussels will change levels and cook evenly. In about 5 minutes the shells will open and the mussels are done. With a big skimmer (or chopsticks), dip the mussels into wide soup plates or bowls. Allow the cooking liquid to settle for a moment so any sand will sink to the bottom. Then ladle the liquid over the mussels, sprinkle with parsley and lemon zest. Serve immediately. For whatever reason, the French have a bad rap for being rude. Whenever someone asks me if this is true, I have to find it in me to not take them by the shoulders and remind them that there are rude people everywhere, not just in France. Some of the friendliest people I’ve ever met were French. With that said, I want to talk about our visit to Ligny-le-Chatel, a village in Burgundy where we stopped on the way to Auxerre, the town where Pierre’s family once lived. The purpose of our visit was to meet some close friends of Pierre’s late grandparents. A quaint village with a population of just over 1200, it had an impressive church and a peaceful, somewhat rural setting. We arrive at the country farmhouse of Françoise and Jean Dapremont. Françoise comes out to greet us and I immediately feel welcomed by her affable and cordial demeanor. She is probably in her mid-late 60’s and like women of her generation, her hair is perfectly coifed and her language is pleasant and polite. She introduces her husband Jean and their little grandson Roland, who is staying for the weekend. As we sip our brandy and chat, I can smell the aroma of roasting meat and yummy goodness wafting through the air. Always aware that I’m the only non-French in the group, I have to harness my American tendency to act like an over-eager child when something excites me. So, when Françoise announces that dinner is ready, I quietly remind myself not to jump out of my seat and run to the table. At the table, we begin our meal with a smooth and luscious terrine of coquilles St. Jacques (scallops), dotted with carrots and red bell pepper. Our main dish is a plate of roasted local saucisses. They are accompanied by petit pois that she served in a beautiful casserole. Les petits pois à la Versailles, she says proudly, handing me the dish. She explains that she got the recipe from a friend who once tended the gardens at the castle of Versailles. Well, this ought to be good, I thought. And it is. One bite reveals tender peas, savory bacon pieces, and of all things, sweet and slightly wilted lettuce; a simple yet brilliant dish that I’ve adapted and present to you here. Boil the pasta in salted water until al dente (about 8-10 minutes) and drain in a colander. Using the same pan, set the heat to medium and cook the bacon until the edges are slightly crispy. Next, toss the frozen peas and lettuce in with the bacon until the peas are heated through and the lettuce is slightly wilted. Add the cooked pasta to the pot and stir to combine. Serve with freshly grated gruyère or parmigiano reggiano and mint. To me, there is nothing like a good bowl of Phở, with its rich, satisfying broth – infused with ginger, onion and spices, and warm rice noodles spiked with fresh herbs, lime and chilies. It’s my comfort food and I would eat it everyday if I could. When I go home to Orange County, one of the first things I do is head out to what local Vietnamese call “Bolsa” (which we fobby folks pronounce Bone-sah) . There, with friends or family, I’ll get my phở fix at one of the many phở shops that line Bolsa Avenue in Westminster. Once seated at our table, we’ll order our phở in whatever way we like– with cooked brisket (thịt chín), tendon(gân), tripe (sách); with beef balls (bò viên); with cooked flank (thịt nạm) and thin, rare beef slices (thịt tái); or a combination of all the above in what’s known as Dặc Biệt. Within a matter of minutes, our steaming bowls arrive at our table along with a plate of garnishes which features fresh herbs: thai basil (rau quế), coriander aka cilantro (rau ngò), saw-tooth herb aka culantro (rau ngò gai), bean sprouts, fresh chilies and lime wedges. Sipping my bowl of pho, I marvel at how simple and refined this dish is, for example, in the way the spices sort of echo the flavors of the fresh herbs — the coriander seed with the cilantro and the star anise and cinnamon with with the thai basil. It’s hard not to have your senses awaken to what is hot, sour, salty and sweet. Here, in the Midwest, a good bowl of phở is more elusive than perhaps Britney Spears’ underwear. And believe me, I’ve searched —- for phở, that is! Thus, my only choice is to make my own. In my opinion, it seems only fitting to make a large amount of phở broth so you can invite as many people over as you can and if there’s any broth left over, which there often is in my home, you can freeze it in 2-quart containers. 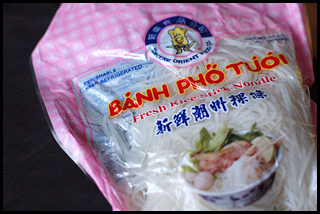 These are perfect to make 2 big bowls of phở anytime later when you’re in a pinch. The broth is the essence of this dish and so there’s no room for cheating or shortcuts, which means no instant phở paste, imitation phở seasoning or canned broth. Sorry, Sarah Moulton. Yes, making phở at home is laborious. Be prepared to spend a few hours on preparing the ingredients and many more hours to simmer the broth. At our home, making phở was something usually reserved for the weekend. My mom would often make the broth a day before and assemble the rest of the ingredients the following day. In the end, your reward will be something that is not only delicious but also free of preservatives and artificial flavor enhancers (like MSG). Amen to that! To begin, dry-roast the spices in a small skillet on medium heat. Watch carefully as the spices can scorch easily. As the spices toast, they’ll become fragrant and deeply hued. Remove from heat and tie them inside a cheesecloth sachet or large tea infuser. Set aside. Cut the onion and ginger lengthwise, leaving the skins attached. Place the onion, ginger and shallots on a baking sheet and broil them until their skins are nicely charred and blistered (usually 2-3 minutes). Remove from the oven and set aside. To make a clear broth, begin by parboiling the beef bones. Place the bones in a large stock pot. Cover with cold water and bring to a boil. After 3-5 minutes, drain the bones and give them a good rinse and scrub to remove the most of the sediment. Next, add 7-8 quarts of cold water to the bones and bring to a boil. Skim off any of the scum that rises to the top. Add the beef tendon and beef brisket. Then, add the charred onion, ginger and shallots (skins attached) to the broth, along with the spice sachet. Add the salt, fish sauce and sugar. Bring down the heat to low and simmer for about 2 hours. At this point, the brisket will be ready. It should be cooked through and feel slightly springy to the touch. Remove the brisket from the pot and set it on a plate. Immediately tent with plastic wrap or foil. Continue to simmer the broth another 2-2.5 hours. At this point, the tendon should be ready. Remove it from the pot and place it next to the brisket and cover again. Taste the broth and adjust for seasoning (fish sauce/sugar). Once the tendon has rested for at least 15 minutes, slice the tendon and the brisket into thin slices (against the grain). You may also slice the beef balls in half. Rinse the tripe in hot water and thinly slice (It’s sold pre-cooked). You’re now ready to assemble the bowls. Cook the noodles according to the package instructions. Divide the noodles among the bowls and layer the slices of cooked beef brisket, beef tendon, beef balls, beef tripe and raw beef sirloin slices. Top it all off with the yellow and green onion slices and fresh coriander. When you’re ready to serve the phở, bring the broth to rolling boil. Ladle the hot broth (3-4 ladles’ worth) into the prepared bowls and sprinkle fresh cracked black pepper on top. Serve with the herb and vegetable garnish and allow your guests to hand-tear into their bowl whatever amount they like. *When using dry noodles, be sure to soak them in lukewarm water for about 10 minutes – not longer, as they can become soggy. Unlike regular pasta, you’ll want to boil individual servings of the noodles (they cook very quickly, usually in less than a minute). Place a handful of the noodles into a mesh sieve and immerse in the boiling water. When the noodles are “al dente,” lift the sieve, shaking to remove excess water and drop the noodles into the serving bowls. **A tip for slicing the beef sirloin is to place it in the freezer for about an hour. This way, it’s easier to cut very thin slices of beef which will cook to rare (or med. rare) once the hot broth is ladled onto it. A trip to any local farmer’s market this time of year is sure to be a treat. I love love love the end of summer here when the tomatoes are at their peak. Red, yellow, orange, green, — you name it, it’s all good. Combine that with the abundance of fresh, green herbs and you’ve got a party. Seriously, if I was a tomato vendor, I’d totally wear one of those crazy velour sweatsuits with “Juicy” stitched on my bum. Whip the eggs, milk/cream, salt and pepper with a wire wisk until thoroughly combined – up to 2 minutes. Then, blend in the herbs. Pour the egg mixture into a preheated, preferably non-stick skillet. Cook uncovered on medium heat. As it’s cooking, use a spatula to lift the edges up slightly while tilting your pan to allow mixture drip to the corner of the pan. This helps to evenly cook the omelet. Repeat until the egg mixture no longer runs to the edge. At this point, place the goat cheese along the center of omlette and delicately flip one side of the omelet over. Slide onto a plate and cascade your cherry tomatoes on top and next to the omelet. Serve thick slices with the tomatoes. Bon appétit! Next up, we’ve got a dish that I prepared last night. It took me about 20 minutes to get this onto the table. How ’bout that, Rachael Ray?! Anyway, I bought some baby Yukon potatoes that I boiled (unpeeled) in salted water. When they were done, I drained them and then tossed them with some olive oil, sliced green onions, minced parsley and salt+pepper. Next I thinly sliced a baguette and smeared some leftover goat cheese. I drizzled a little olive oil and hit that with some S+P and put them under a broiler for a minute. I purchased some salmon from Bello Vino and seared them on med-high heat. To plate the dish, I placed some lovely green lettuce and halved, cherry tomatoes on the plate. Sprinkled that with some S+P and olive oil. The warm potatoes were next and the salmon placed on top. I garnished with the goat cheese croutons and voilà! At last, we have a dish that I never tire of making or eating. It’s such a simple, summer salad that I picture myself sitting across from Hemingway at a Paris café, eating this salad and chatting about Picasso’s legacy. Just kidding. But really, do I need to say more? Toast or grill your baguette slices. When they are done and while they are still warm, rub the cut side of the bread with the raw garlic clove. — This is something I learned from my friend Carmen. It does wonders to plain bread — trust me. In a small pan with lightly boiling water, add a dash of vinegar to the water. Then, add your eggs one by one. The vinegar is supposed to help preven the egg whites from thinning out too much. After two minutes, the eggs should be ready. Their centers should still be soft and a little jiggly, like an oeuf mollet. To plate the dish, place the poached egg on the bed of lettuce. Using the tip of your knife, slice through the yolk and open the egg a bit. Drizzle the vinaigrette all over – be careful not to over-do it. Place some fresh slices of tomato, sprinkle good S+P and you’re practically rubbing shoulders with Hemingway.